A sampling of the goings-on at our Customer Appreciation Celebration in January. Thanks to everyone who sent in their photos! SSSUUUUUUPPPEERRRR ROSCOE!! In his "snow suit". Saturday, February 26th marked ten months into Peanut's pregnancy and our Expecting Mare/Foaling Management Workshop. Ten of us braved the cold weather to view the first signs of swelling in the udder, protrusion of the milk vein, and the overall size and shape of the mare's barrell. Dr. Kendra Boehnke gave us a jam packed lecture and some demonstrations. Participants viewed ultrasounds of the entire growth process from conception to birth. We learned about normal temperatures in the foals vs. adult horses, birth defects, colustrum, meconium, normal and abnormal behaviour in the foal and the mare, how to milk the mare in case of emergency, the procedure for giving the foal an enema and much, much more! We owe a HUGE thank you to Dr. Boehnke for her time and effort - we'll see you when there is a happy, healthy (our fingers are crossed) foal on the ground! 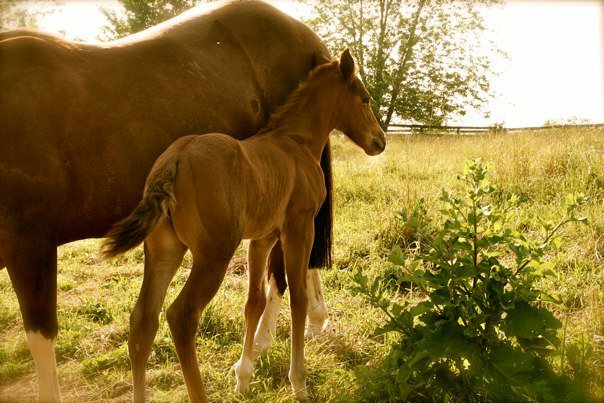 Interested in learning more about expecting mares and foals? Hayes Horsemanship students are invited to participate in this workshop with Dr. Kendra Boehnke from Ilderton Equine Services. Dr. Boehnke will be administering yearly vaccinations, an ultrasound and she will be teaching us about signs to look for when the mare is ready to foal out. We will also cover how to be prepared if there are any difficulties during labor. Spaces are limited due to the nature of workshop. Please confirm your spot with us as soon as possible. $15 per person must be paid in advance to reserve a space. Also, we ask that any non-participants (siblings, parents, drivers etc.) remain outside the barn area during the workshop to keep traffic and noise to a minimum for the horses. Directions to the farm in Lucan will be provided upon confirmation.